Sowerby Bridge was one of the many towns and villages in West Yorkshire badly affected by the recent floods. 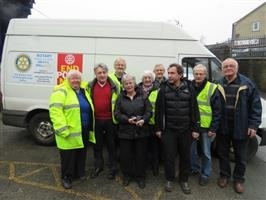 This is a report on how the Rotary Club and local community responded. The dreadful impact of the flooding in Sowerby Bridge on people, homes and businesses literally brings home what the people of the Calder valley have already had to deal with a number of times over the last few years. Once again it raises the issues of planning, support and the allocation of appropriate funds to assist those affected and stop it happening again. These issues are very complex and need far more than government ministers paying short term lip service to them. They, the Environment Agency and other organisations must implement a credible, long-term, plan of action to stop this increasingly regular destruction of lives, homes and businesses - we must all maintain the pressure on them to do this through every means at our disposal. Not just while the mud is being scraped away, furniture and furnishings replaced and businesses [hopefully] splutter back into life, but ongoing pressure so they are not allowed to forget it and let less important issues take the limelight. That said [and it needs saying, and acting upon], what has been truly uplifting has been the way people have risen to the occasion, supporting and helping each other out. Speaking specifically of Sowerby Bridge as it is where I live and work, the number of people that came out to help, almost immediately was humbling and I am proud to be a member of the local Rotary Club whose members made a significant contribution to those efforts. Sowerby Bridge is a relatively small club of just over 30 members but all of these threw themselves into many aspects of the response to the floods and associated disruption from the start. We even managed to arrange a Flood Disaster Emergency Meeting of members at our usual meeting place, The Sportsman at Greetland, on the evening of the 28th [even a littl e before Calderdale Council's committee we believe!]. This meeting planned further help and we were joined at that meeting by 'the 2 Jo's' who are the Sowerby Bridge Tesco Community Support staff members who work tirelessly for the local community and with whom we have worked on a number of projects in the past. During this emergency they have 'walked the streets' with food supplies and drinks and acted as a collection point for customer donations. At that meeting it was suggested by the Jo's and agreed by members that we would man a Flood Relief Collection operation at Tescos. This was done every day until Sunday 4th and the wonderful people of Sowerby Bridge who came into Tescos donated over £6200 which will go to the Calderdale Foundation Flood Appeal Fund. Part of the collection team in the second pic. 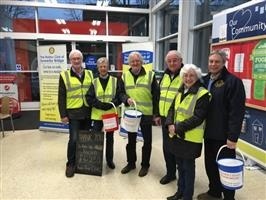 We are part of Rotary International District 1040 and their District Governor, Hazel Haas has pledged support as well as informing us that the District will be raising a Rotary National Disaster Fund Appeal for York and the Calderdale areas affected by the floods. We are also lucky that we have local Councillor, Mike Payne in the club. Apart from working tirelessly throughout, he was able to keep us informed of what was happening and how needs shifted as the emergency progressed.